Anna Eleanor Roosevelt was born in New York City into a wealthy and socially prominant family. Eleanor's parents died when she was young. She was a shy and unhappy girl. Eleanor went to school in England. Eleanor married Franklin D. Roosevelt, a distant cousin and a friend. Eleanor Roosevelt had a lot of sympathy for people who were poor and had problems. She became active in charity work. Eleanor was also a helpmate to her husband in his political career. She was his eyes and ears as she traveled and worked with the poor. 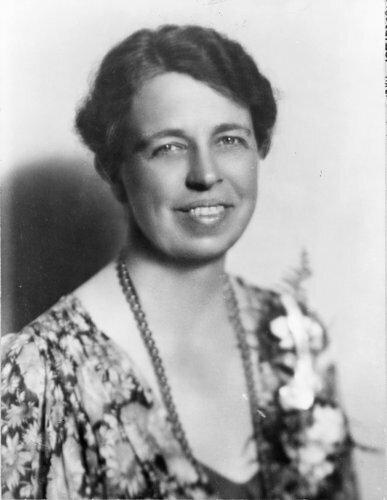 Eleanor Roosevelt became the First Lady of the United States when her husband became president in 1933. As First Lady, Eleanor conducted social events at the White House, traveled around the country, gave lectures and radio broadcasts, and wrote a newspaper column. After her husband died, Eleanor tried to retire from public life, was was called to serve as an spokesperson to the United Nations. She continued her work until her death in New York City. She was buried beside her beloved husband in Hyde Park. Page created June 8, 2007. Anne Pemberton. Updated Mon, Feb 6, 2012. AP.